If you couldn't tell by the title this is primarily a BlazBlue fighter. 13 combatants (three are free DLC) hail from the series, compared to the seven each from Persona 4 Arena and Under Night In-Birth, and the four from RWBY. As usual we have to talk about the pricing scheme, because someone is going to point it out and use it as an excuse to ignore the rest of the review. In case you haven't heard, RWBY's inclusion warranted controversy as they were immediately billed as "one of 20 DLC fighters." I asked Toshimichi Mori to clarify the issue myself, and he agreed that the message was muddled. In response, Cross Tag Battle's price was shifted to $50, with an "everything included" edition for $70 and a free DLC for the first two weeks. There's a simple formula for this one that you can follow along with at home without a calculus degree. Do you think [x] characters is worth [x] amount of money? It's your choice. Anyway, onto the actual fighting system! You have your standard two-button system with auto-combos (a recent staple of many fighters), ground and aerial recoveries, powered up EX moves, your basic stuff. But Cross Tag moves us into the arena of 2v2, and swapping is as easy as pressing the X button on PS4. You can also call them out from the sidelines for three different assist moves (R1), and initiate clashes, or double combos. Alternatively you can all in an assist during a super, which keeps the damage going and tags out safely mid-ability. If you drop to one fighter you can opt for a Resonance Blaze power-up, which is a sort of X-Factor that lasts 15 seconds, enhances chip damage, allows more skill cancellation, auto-fills meter, and recovers your red health gradually -- it also unlocks your instant-kill if you have enough meter to pay for it. There's a catch too, as the more partner skills you use, the greater the blaze's power will be. After all these years of playing a litany of tag fighters, I've sort of swayed into the favor of 2v2. I like the intimate feel of just managing one swap and the tempered challenge of picking duos with good synergy. It's also arguably easy to balance as the assists aren't game-changing (in 3v3 joints folks will often pick one member to use just for assists, with no intention of actually fighting with them). 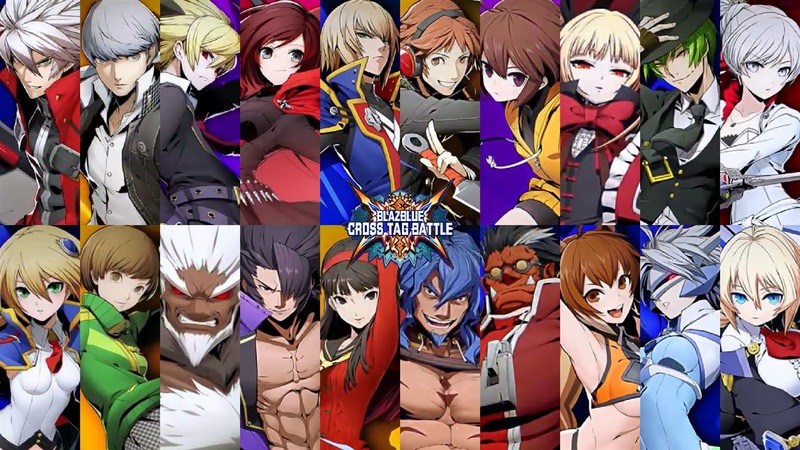 It's enhanced even more in Cross Tag given the sheer enjoyment of pairing up some of these duos like Ragna and Noel. To navigate all of this madness Arc once again utilizes the hub from Guilty Gear Xrd (which was brought back for the more popular Dragon Ball FighterZ), allowing players to frolic around as a cute little avatar in a mini-game world. It's a glorified menu (you can even just bring up the quicker UI with the press of a button), but it's a nice little touch that adds some character -- especially when said avatar gets tired of your nonsense and falls asleep. On top of online play (which we couldn't fully test, but will keep you updated with by way of news updates) there's the story-like "episode mode," a training module, versus play, tactics (read: a mission mode that doubles as a tutorial), survival, and gallery extras. Dual Japanese/English audio is in, and yes, you can even set individual languages for fighters in combat. My only gripe here in terms of gametype delineation is that I really think the tutorial should be brought out into its own thing to better onboard players of all skill levels. There's going to be a lot of newcomers coming in due to the involvement of any given franchise, and having a tutorial even close to as good as Arc's own Guilty Gear Xrd: Rev 2 would be beneficial. The mission-baked one right now is far too dry, also requiring players to awkwardly "end missions" by pressing R3 (function two) instead of dynamically flowing into new concepts or presenting fun new ways to approach fundamentals like movement. 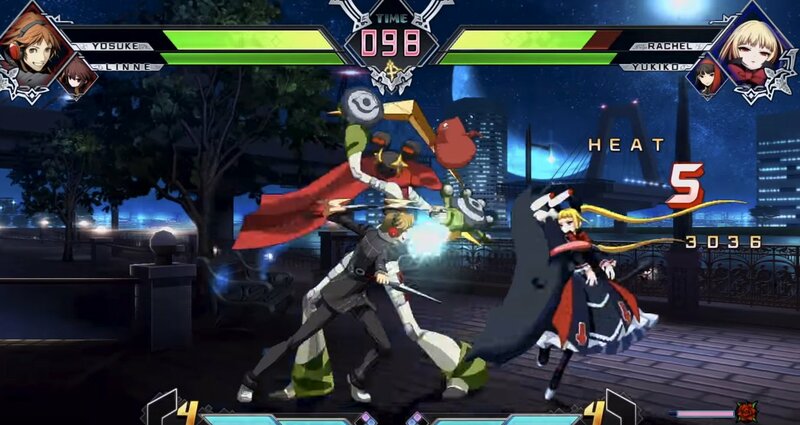 Yet, BlazBlue: Cross Tag Battle pretty much speaks to everyone, even if a few of its core mechanics aren't as refined as several of Arc's other works. It has a wide array of cast members from several universes, a pointed 2v2 focus, and a sufficient amount of stuff to do if you aren't the online competitive type. I sincerely hope this sets the stage for more experimental "all-star" types of fighters from Arc, as they have a seemingly limitless well of ideas to draw from.